From Prospect Heights Patch: It took 15 years for Dr. King's birthday to become a national holiday and it wasn't easy. There was fierce opposition from several sources, not the least of which was Senator Jesse Helms (Republican, North Carolina), he accused Martin of being a communist. 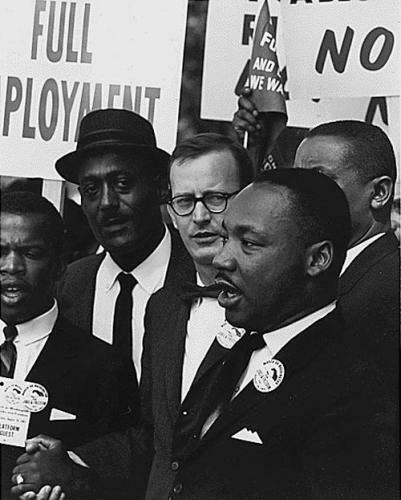 Four days after Dr. King was killed, Representative John Conyers (Democrat, Michigan) submitted legislation for his birthday to be made into a holiday. In 1970, 6 million people signed a petition (it's believed to be the largest number ever to sign a petition) to have Martin Luther King, Jr's birthday made into a holiday. Their cause was aided by Representative Shirley Chisholm (Democrat, New York) who helped John Conyers submit new legislation each session of Congress. On November 2, 1983, President Ronald Reagan signed the law into being that made Martin Luther King, Jr's birthday a national holiday. On January 20, 1986, we celebrated for the first time a national day of reverence to Dr. Martin Luther King, Jr.